Detection of PLA2R1 and THSD7A antibodies by Western blot and IFT. 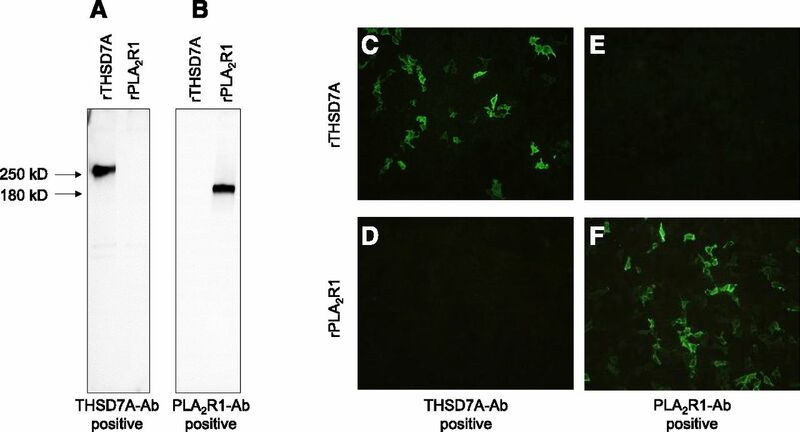 Representative Western blot analyses of (A) a THSD7A-Ab–positive serum and (B) a PLA2R1-Ab–positive serum reacting with the respective protein. In the IFT analyses, (C) the THSD7A-Ab present in the patient serum binds to THSD7A-expressing HEK293 cells that are coated to the biochip, whereas (D) the THSD7A-Ab–positive serum does not react with HEK293 cells expressing the PLA2R1 protein. (E and F) Conversely, the PLA2R1-Ab–positive serum exclusively reacts with the PLA2R1–expressing HEK293 cells. Results of THSD7A-Ab measurement results by IFT and Western blot (WB). When measured by WB, 39 THSD7A-Ab–positive patients could be identified. In 36 of these patients, THSD7A-Ab could be detected by IFT. 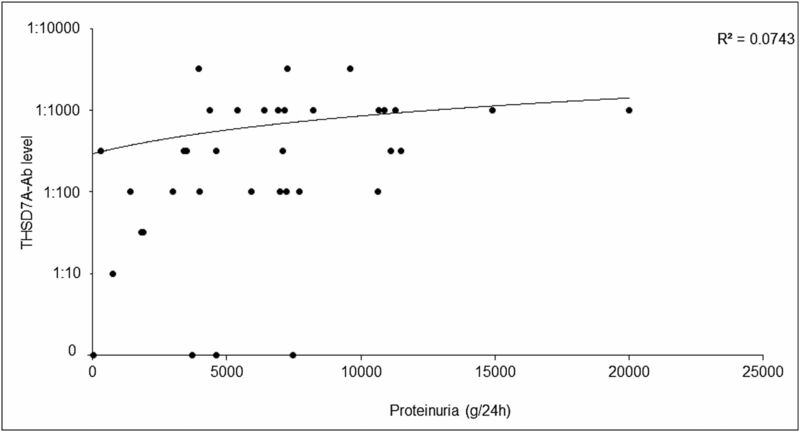 Correlation of proteinuria and THSD7A-Ab levels at the time of inclusion in the study. The THSD7A-Ab-level did not significantly correlate with the level of proteinuria in 36 patients with THSD7A-associated MN, for whom data on proteinuria and THSD7A-Ab levels at the time of study inclusion were available. Renal biopsy findings showing a THSD7A-associated MN in a patient with malignancy. (A) Immunohistochemical analyses showed a finely granular positivity for IgG but not for IgG4 (not shown) along the glomerular basement membrane. (B) A strongly enhanced glomerular THSD7A positivity was detectable. 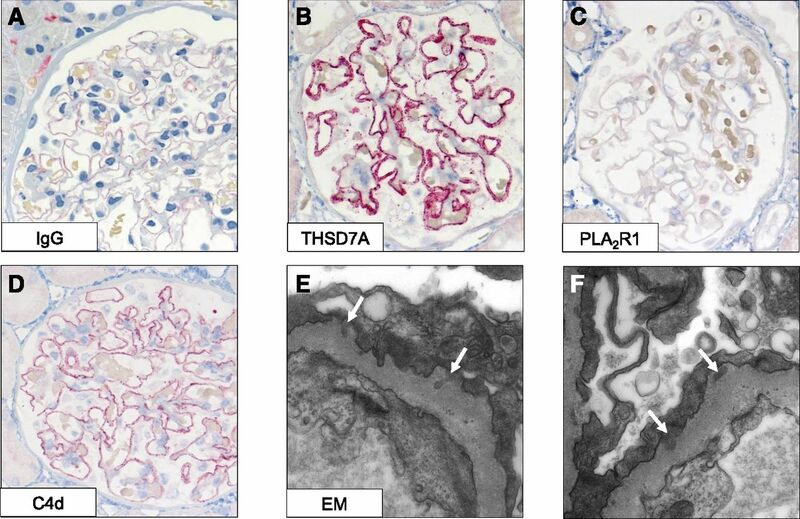 (C) The glomerular staining for PLA2R1 was not enhanced. (D) C4d staining also showed a granular positivity along the peripheral glomerular basement membranes. (E and F) Electron microscopy (EM) showed irregular outer contours of the glomerular basement membrane with small spikes and very small electron–dense immune deposits (arrows) on the epithelial side. Morphologic, immunohistochemical, and FISH analyses of the metastases–infiltrated lymph node. (A) Metastases of endometrial carcinoma infiltrating an abdominal lymph node. (B and C). 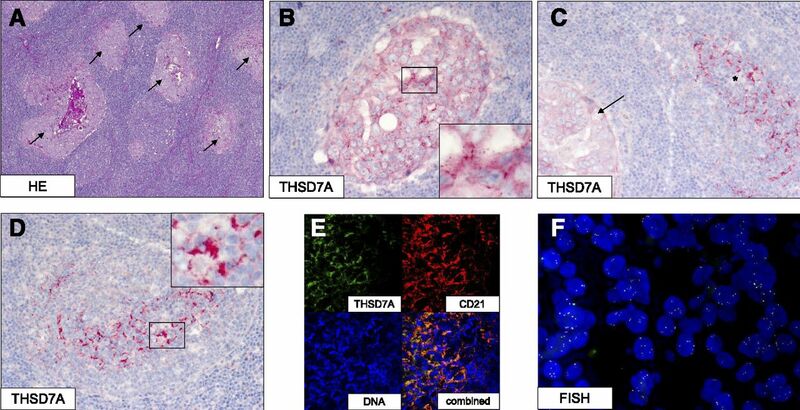 The tumor cells are positive for THSD7A in immunohistochemical analyses (arrow in C). (C and D) fDCs of the lymph node, which is infiltrated by metastases, are positive for THSD7A (asterisk in C). (E) Immunofluorescence staining of the same lymph node shows positivity for human THSD7A (green) on the CD21-positive fDCs (red; DNA is blue). (F) FISH analysis of the metastasis showing polysomy of chromosome 7: green signals represent THSD7A gene loci, and red signals represent centromere 7 (chromosome 7 centromere). Patients with a newly diagnosed biopsy–proven MN were included in this cohort. None of the patients had received immunosuppressive therapy before the time of study inclusion. 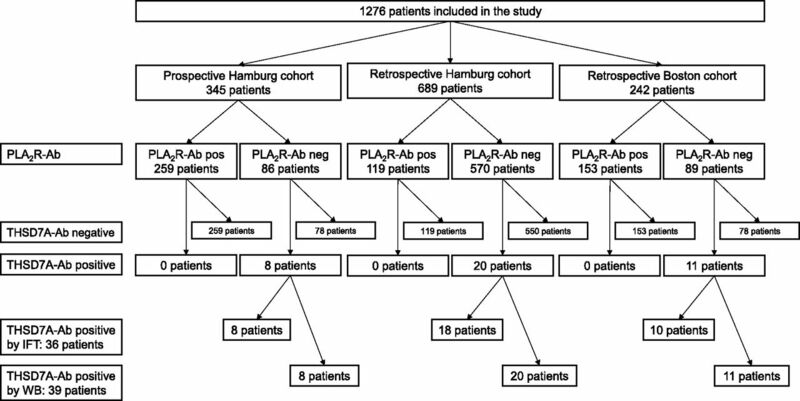 There were significantly more women in the patient cohort with THSD7A-associated MN compared with PLA2R1-Ab–positive patients. Patients with THSD7A-associated MN were younger and had lower proteinuria than patients with PLA2R1-associated MN, but these differences were not statistically significant. Serum creatinine was lower and eGFR was higher in patients with THSD7A-associated MN compared with in patients with PLA2R1-associated MN or patients who were negative for both PLA2R1-Ab and THSD7A-Ab. Patients with THSD7A-associated MN had a malignant disease significantly more often than patients with PLA2R1-associated MN. In these analyses, a Bonferroni adjustment was performed to account for multiple testing, according to which statistical significance is defined at P=0.03 (0.05/2; 2= no. of comparisons). IQR, interquartile range; CKD-EPI, Chronic Kidney Disease Epidemiology Collaboration. Prot, proteinuria; S-Crea, serum creatinine; W, woman; neg, negative; M, man; CsA, cyclosporin A; Pred, prednisone; na, not applicable; CYC, cyclophosphamide; MALT, mucosa associated lymphoid tissue. Interstitial fibrosis was classified as minor, moderate, or extended when ≤15%, >15% but ≤50%, or >50%, respectively, of the tubulointerstitial space was involved. ↵a Analysis of IgG1 could not be performed in two biopsies; in these cases, no more renal tissue was available. ↵b The number of inflammatory cells per glomerulus was analyzed as described in a previous publication.19 Inflammatory cells were counted on 105 glomeruli from renal biopsies of patients with no malignancy and 20 glomeruli from renal biopsies of patients with malignancy.